I’ve put a theme together and packaged it up on github. 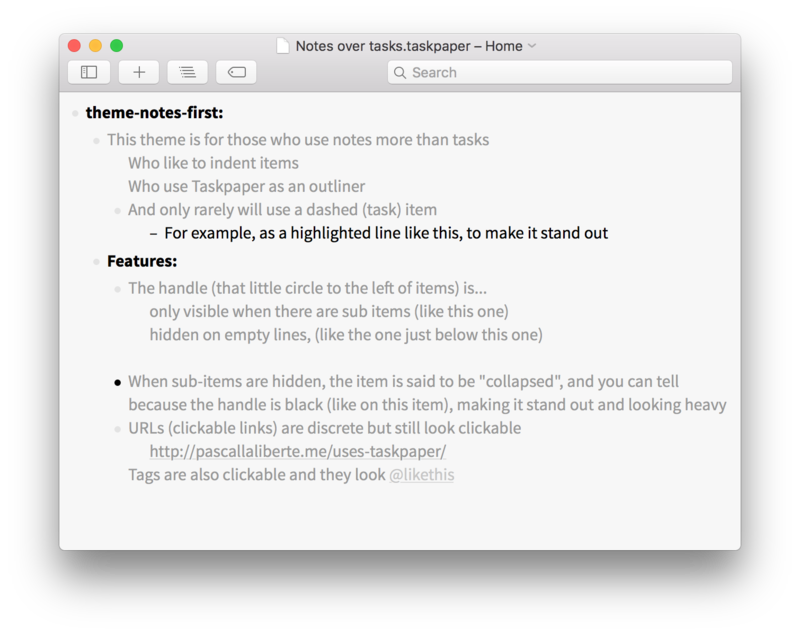 A Notes-First StyleSheet for Taskpaper. Contribute to pascallaliberte/theme-notes-first development by creating an account on GitHub. Use notes items more than you use tasks items. For example, I indent a lot, I write objectives more than I write todos, and I save the dashed lines for emphasizing certain lines. To install, the instructions are on github. A few terminal commands to put in and you’re set. The trick allows you to keep it updated and make your own tweaks too. Hope you like it. Big thank you to Jesse for Taskpaper 3.
this is great. thank you for making it! The handle for the collapsed items is now slightly-bigger than the rest, and dark gray instead of black. Thanks @jessegrosjean for the handle-size property.